A guard stands watch day and night over The Hogar Rafael Ayau Orphanage, located in one of the toughest parts of Guatemala City. The orphanage is operated by the nuns of the Monasterio Ortodoxo Lavra Mambre, and operates solely on donations. The 150-some children in the only Orthodox Christian orphanage in Guatemala are wards of the orphanage because of abuse, neglect, no trace of their parents, or mothers and fathers who simply cannot provide for them. PSG Construction partner Stephen Gidus spent nearly three weeks at the orphanage this summer, assisting with a summer camp for the children. Trips are organized by the Orthodox Christian Missions Center in St. Augustine, Florida. One orphan named Henry soon became Stephen’s regular companion at the orphanage. About seven years old, Henry would wait for Stephen at his dormitory entrance. They would often take meals together. When Samuel, another orphan, first met Stephen, he shyly hid his left cheek against his shoulder. He was embarrassed by the ugly scar his father left when he attacked him with a hot iron. Once Samuel saw that Stephen was not interested in how he looked, he no longer hid his face. 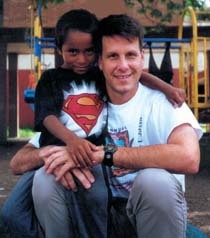 Stephen’s brother and PSG partner Paul was building a home for a poor family in Mexico during this time. This was Paul’s third year volunteering for Project Mexico. Paul learned that it is not necessary to travel to another country to perform acts of mercy. Readers can learn more about the Hogar Rafael Ayau at www.ocmc.org.